It recently came to my attention that Texas Instruments launched a new initiative called STEM Behind Health. STEM Behind Health is designed to get students excited about health related careers. Activities from the initiative include a TI-Nspire document file as well as student worksheets and teacher notes. They were developed in conjunction with health care professionals and follow real patients and their health conditions. The first released activity is “Chelcie’s Story.” Chelcie is a 22-year old nursing student who has was diagnosed with Type 1 diabetes 10 years ago. I spent a few minutes playing around within the activity, and it is another great example of how the TI-Nspire platform allows for really polished interactive lessons with students. 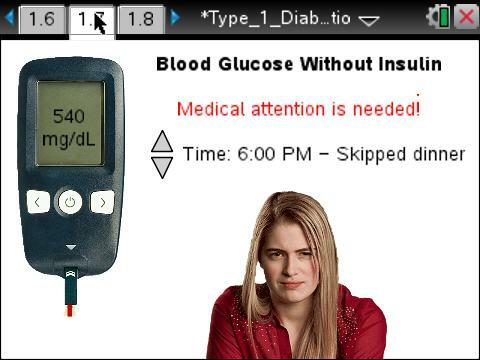 In addition to the sort of standard notes and quiz questions that TI-Nspire users have come to expect, there’s a very nice interactive component with a simulated blood glucose meter that allows students to take readings for Chelcie’s blood sugar and experiment with insulin to carb ratio. The results are automatically plotted so students can examine the relationship. Peter Balyta, Texas Instruments President of Education Technology, also took part in a video explaining TI’s commitment to STEM Behind Health. With STEM Behind Hollywood and now STEM Behind Health, Texas Instruments is developing a really great set of lessons for teachers to use in their classroom with minimal preparation. I know from experience how time consuming it can be to develop engaging lessons on your own, so if you are a math or science teacher, take a few minutes to check out the official STEM Behind Health site to see if it could work for your students.